The University of North Carolina-Chapel Hill, a Silver BFU. 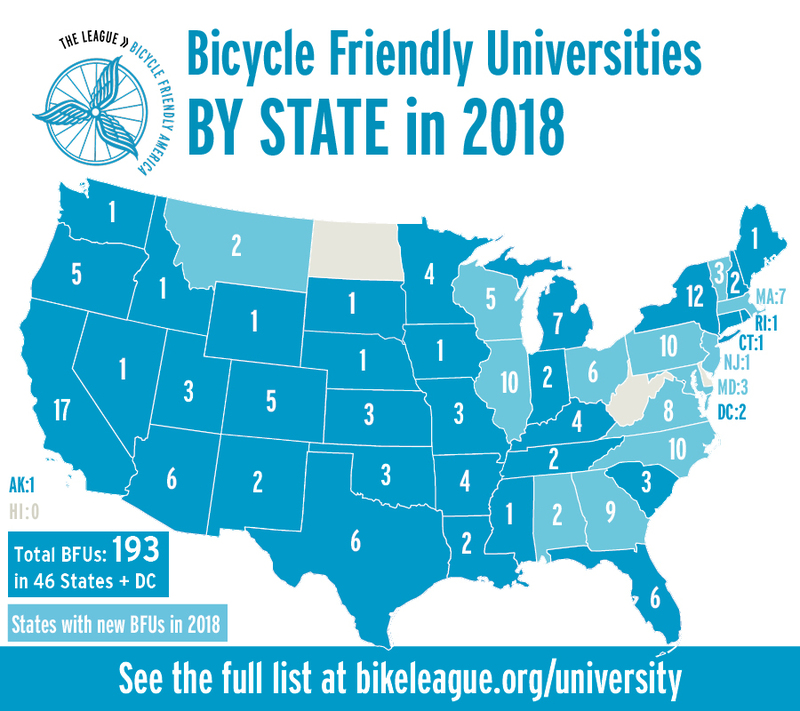 The League of American Bicyclists is proud to announce 45 new and renewing colleges and universities with Bicycle Friendly University (BFU) status today. 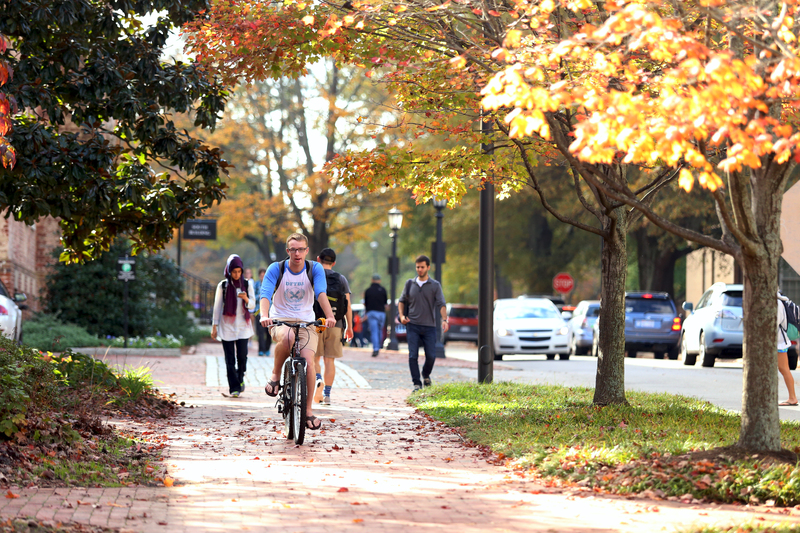 These colleges and universities have proved outstanding in their support of bicycling to ensure healthy, accessible, and eco-friendly transportation and recreation for students and staff. Including this new group of BFUs, there are now a total of 193 colleges and universities that have this designation nationwide. Of the four achievement levels of Bronze to Platinum, the League presented seven Gold, 16 Silver, and 22 Bronze awards. No Platinum level recipients were chosen. The League did recognize five universities and colleges with Honorable Mention status. “When the League launched the Bicycle Friendly University Program in 2011, our goal was to inspire higher education institutions to develop more sustainable, livable campuses that made biking better for students, staff and visitors,” says League Executive Director Bill Nesper. The latest class of BFUs reside in 20 states and range in size as small as Green Mountain College in Vermont with 399 students and as large as Texas A&M with 68,000. According to Amelia Neptune, director of the League’s Bicycle Friendly America Program that administers the BFU Program, BFUs can be found in 46 states and the District of Columbia. In 2018, Pennsylvania received the highest number of new BFUs with six, while California, Massachusetts and North Carolina tied for second with four new BFUs each. 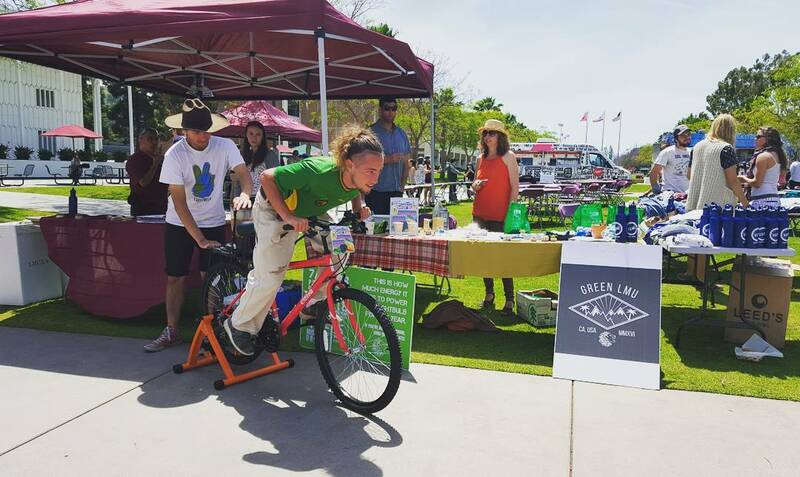 Student with bike-powered smoothie blender at Loyola Marymount University, a Bronze BFU. The BFU application review process is a mixture of institutional reporting and on-the-ground bicycle advocate feedback. Each applicant must complete a comprehensive audit via more than 100 data points followed by a League call for input from local cyclists. This combination generates a fair, holistic picture of the institution’s performance of the “Five E’s”--engineering, education, encouragement, enforcement and evaluation. A national judging panel then reviews the information to determine if an award is warranted. For details, visit http://bit.ly/BFU_Scoring. In addition to awards, the League provides year-round coaching, online tools, trendspotting and case studies to help higher education institutions improve and promote campus cycling. Visit www.bikeleague.org/university to access this resource library and follow the League’s popular blog at http://bikeleague.org/BFU_blogs to read compelling BFU stories, analyses and trends. Submissions for the 2019 Bicycle Friendly University Awards are now open. The deadline is August 22, 2019.